A big part of being able to build and tinker is having the correct tools and components. In this post I will show everything I use to completely solder a QuinLED board so you can get the right kit! The index for this series can be found here. 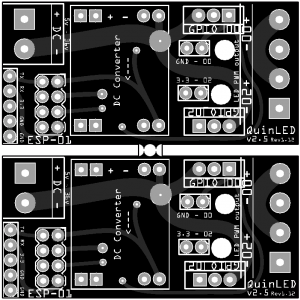 I’ve uploaded a new article and video detailing version 2.6 of the QuinLED PCB! Check it out by clicking here! I’ve checked and updated all the links! I’m starting off with a video because I think it’s easiest to show everything I’m going to use and tell you why or how I’m using it. Following after the video will be a complete kitlist of the items you need. Please check below for version 2.6! Since I’m pro open source, you can download my board designs for free! I make the PCB designs in fritzing. But a board house mostly only takes gerber files. Click here to download a ZIP file with both included. Please check out the following post for the newest board files. Version 2.6 replaces all older versions! Click here to view the new post and order links! They only charge you 14$ for a protopack (at least 10)! And since QuinLED is panalized, you actually get 20 QuinLEDs in total! You can use my design for any project you wish, have fun with it! Also I’d love to hear from you if your going to make some QuinLED’s or if you made some changes to the boards or really only used it as inspiration for your project. The only exception is commercial projects. If you wish to use any of my designs in a product that is going to be sold (in whatever form) please contact me first. The resistor placement and design on this board sadly enough failed testing. The boards work just fine without them but I think I botched something up while the designing the resistor layout. For now I suggest just using the boards without them (like my old designs), that way they have tested to work very well! Fixed in v2.6! First I want to talk about the components you are going to need to actually get the board finished. The shopping links provided are from Aliexpress where I also source everything myself. It takes a while to arrive, but you always get your goods and their prices can’t be beat! Most of these items come in bulk, but because I never build only one and they are universal components, I don’t believe that has to be a real problem. You’ll never know when you just might need a jumper or dupont cable for something! A finished board has a material cost of around 7$ with everything included! First off, you need to have the PCB. No I don’t have single quantities or anything like that for sale. The only way to get them is by ordering a protopack from DirtyPCB’s or using the Gerber files and getting it made somewhere else. For 14$ you get 10 boards, which results in 20 QuinLED PCB’s! The link is for version 2.6 rev 1.00. You can order the boards here! Pin headers are the little sticks of metal with a plastic spacer on them. They come in strips of 40 and are easy to snap off. Since they come in handy for some many things, I suggest just getting a bunch of them, they’re quite cheap. They have a breadboard compatible spacing of 2.54mm. The screw terminal block is where the power goes in and comes out of the board. The terminals I used have a 5.00mm pitch, their available in a few different colors. 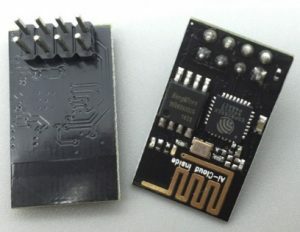 To get the ESP8266 into flash mode, you are going to need 2 jumpers. Luckily, they are dirt cheap! As I mentioned, I made room on the board to house resistors and they might improve the life of the ESP8266 so I suggest soldering them on. Alternatively, you can just cross both resistor pads on the back of the QuinLED PCB and that will also work. 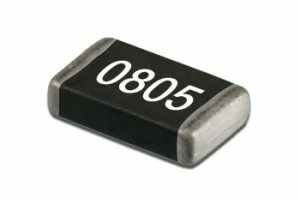 I chose the 0805 size because it’s still solder-able using a pincet. Smaller sizes are practically impossible to do by hand. 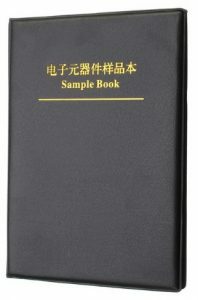 Alternatively you can get a resistor sample book. That way, whatever type you might need in the future, you’ll be set! I find it very handy to have on hand. Because I don’t like soldering the ESP8266 to a board and in my design we need a little bit of elevation above the DC-DC voltage regulator, I use a 2×4 pin header socket to stick the ESP-01 into! The ESP8266 requires a stable 3.3v input but LEDs often run on completely different voltages. To fix this problem I use a pre-built DC-DC voltage converter which solves this problem quite effectively! Selecting the right MOSFET wasn’t easy because I did not have much knowledge about them at the time. But I quickly learned the most important values to look for and in this case that’s voltage handling, amperage handling but most importantly gate trigger voltage and switching speed. And this value is also where Chinese MOSFETs often go wrong. I’ve ordered 2.5v gate MOSFETs which only fully opened around 5.5v! So be careful which you end up buying. If you run into this problem, get a refund from the seller because they are selling the wrong product! 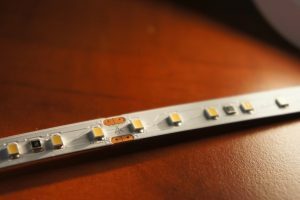 If your LED strip only lights up dimly (50% at max) and/or flickers, your MOSFETs are probably “bad”. You can try and use a different type of TO-220 MOSFET if you can find one. As mentioned above, the most important specfication is that the gate opens fully below 3.3v, which the ESP8266 outputs. Also, make sure it can switch fast enough (but most can). I try and replace the link when I get reports of the seller sending the wrong types. Please let me know! It also helps to report to the seller that they are the wrong type (get your money back) and leave a review on the Aliexpress component that it does not work with 3.3v gate voltage! If all else fails, I now often order these MOSFETs from a local shop (Conrad) and those have always worked perfectly! –update 2018-04-18 – Changed Aliexpress MOSFET link again, hopefully this time you get the correct kind! 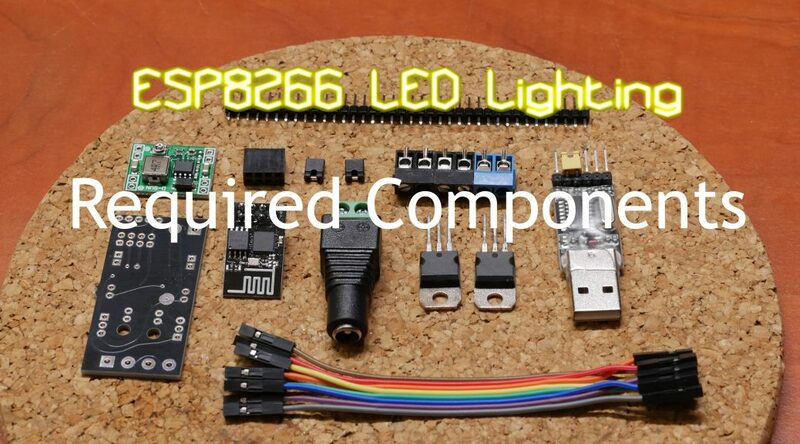 Probably the most important component to buy, the ESP8266! This is the micro-controller which handles the whole program and all the PWM pulsing. Easily programmable and usable with either the native OS, Arduino C, Micropython or NodeMCU LUA, which is what I used to program my dimmer code in! And that’s the last piece for the required board components. With these components you can completely solder a full QuinLED board. But to be able to use it you need some more parts to make it all work! Next to what you need on the board, you need a few components to make everything work. 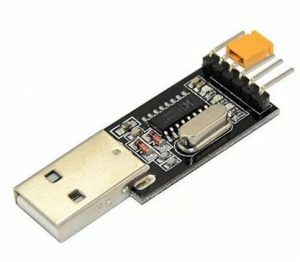 To be able to flash and program the ESP-01 that’s on the QuinLED board you just soldered, you need a 3.3v USB to Serial adapter. You plug this into your laptop and launch a special software tool and it allows you to flash and talk to the ESP-01. More about this in future posts and videos! 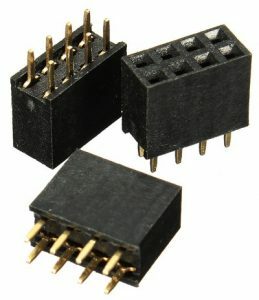 To connect your USB to serial converter to QuinLED or the ESP-01 you are going to need some female to female dupont cables. 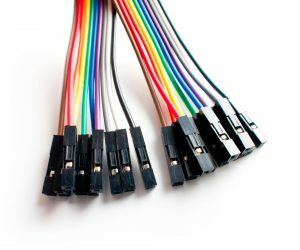 But, since these little cables are dirt cheap, I recommend getting a set of all the different variaties! Next to the required board and external components, you will need just a few more items to have a complete set. The above will allow you to completely solder the board and hook it up to your PC. But in the end you also need some LED lights and a power supply to make everything work! If you are first getting started with this product and don’t have any 12v or 24v LED strip or bars yet, I recommend getting the following. If you need a quick light somewhere these things are awesome! For the complete package they are also quite cheap since you get the strip, caps, mounting clips and a full aluminum bar as a heatsink. Basically a complete kit with which you’re immediately set. They come in a handy 50cm size and you can link a few together if you wish. The above alu bars are a good all in one package and geven a high amount of decent quality light. But if you wish to up the ante and get a great quality, high CRI values and less voltage drop between the start of the strip and the end I recommend getting 24v, High CRI LED strips. I tested a lot of different lights myself and wrote the following article about it here. The design of QuinLED can handle up ~30v without any changes, the onboard voltage regulator will also auto adjust! Just be sure to get the right power supply (see below). These strips have 90 LEDs per meter and as said require 24v. They are available in three different light colors including real, super warm white 2700k which has a lot of red color in the light instead of blue with cheaper LEDs. Fully lit these strips consume the insane amount of 21.6w per meter. But these strips get BRIGHT, like the sun! While dimmed, power usage drops accordingly. Sadly this supplier is no longer on Aliexpress, here is a link to high quality strips! The last part required to make it all work is a power supply! Power supplies come in a lot of different voltages, amperage’s and form factors. Since above we talked about 12v and 24v I will focus on those two voltages. 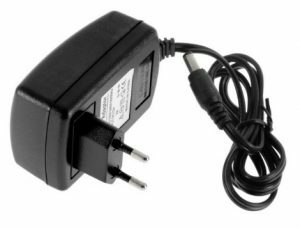 To determine what kind of power supply or adapter you need, you first need to figure out what kind of wattage the total strip you are going to connect is going to require. The one important rule with this is to keep in mind to never use more then 80% of a power supplies rating. If we look above, and want to put up 3 Alu LED bars those will use about 7 watt a piece so three will consume 21 watt in total. Taking that rule and looking at a 5m strip, more wattage is needed. Especially the high quality 24v strip I listed above is VERY power hungry. If you decide to use it extensively, be sure to also read this post about power supplies! 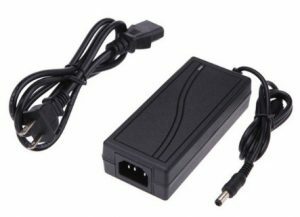 Since the 24v strips need more power then the 12v I don’t feel it’s useful to list any low power adapters. These are supplies I recommend on getting, but aren’t absolutely necessary to have a working setup. They often can make things a lot easier though! 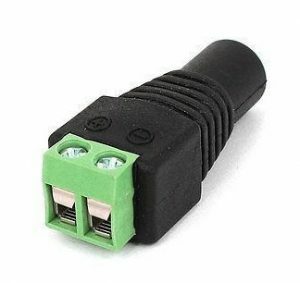 To easily connect QuinLED to a power adapter or brick it’s quick to use a DC barrel female jack. 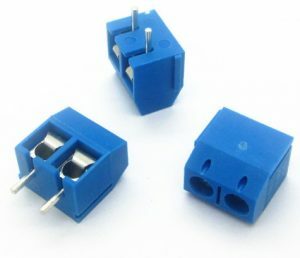 I recommend getting a few sets so you always have the versatility to create easily dis-connectable connections. And that should be it. If everything went correctly you have all the components you saw in the video lying on your table and have all the components you need to build a complete board. In the next post I will discuss the tools you might need (and list those) and also try to put up a sort of soldering tutorial video. I’m not great at it myself but after a lot of practice (building various versions of QuinLED) I’ve gotten pretty decent at making those. I’ll also highlight the order to solder everything together to make it as easy as possible for everyone! As always, question or comments are always welcome. And if you want, please like the video and subscribe to my channel for future updates, I appreciate that a lot! Previous PostESP8266 LED Lighting: Revisit and history of QuinLEDNext PostCampZone 2016 – What is CampZone? I like your QuinLED. My only wish/suggestion would be to add just one more MOSFET channel so as to have 3 total for RGB use. 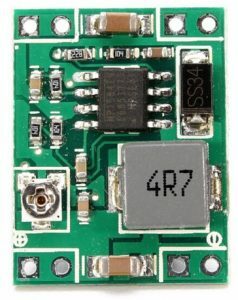 (see similar http://www.esp8266color.com/hardware/). But I like the small form factor of two per dirtypcb board. Not sure I will ever do a 3 channel version. For RGB I will only use WS8212b based strip which needs no MOSFETs at all to run them. It also allows a lot more patterns and such. The strip is a lot more expensive, but I really like the extra features above the static colored lights. I might do a board design for that in the future! I made some of your boards , and they are great ! Cool, thnx for letting me know. I wonder how the fixed the problem of the Arduino IDE for the ESP8266 not really supporting the hardware PWM. I’m guessing someone fixed that part, do you know? And what frequency is it running at (the PWM)? Hi Hamster, you flashed espeasy firmware + used quindor’s init.lua? Or there are new options in espeasy to control this PWM? I tried quindors init.lua which worked fine. The PWM can be controlled by the following…. The beauty is that other espeasy’s can communicate directly with each other. i can create a rule on one esp which is relayed to multiple esp’s (if required) without the need of domoticz rules. I am looking at the parts you are suggesting and I got a question about the power supply. Lately there is more and more comment on Chinese power supply’s. I read that you have to be careful in buying Chinese power supply’s. I am interested on your view on this. I am not sure how to edit my post because I already found a blog entry from you concerning the subject. Ah, good searching! Yeah, I’ve been looking into power supplies and how an American brand compares to a Chinese counterpart. For small stuff, Chinese will certainly be cheaper but quality can be an issue. For larger installations like mine will become Mean Well is actually hard to beat and you are guaranteed quality! That is THE biggest problem with these Chinese powersupplies. The only good advice is to NOT buy crappy cheap chinese PSU’s but source some good local ones. I go as far as to ditch all powersupplies that come with chinese equipment. The few extra euros a ‘real’ psu costs is not worth the risk to me. Yeah, Chinese power supplies CAN be a problem, depending on your usage and the quality you end up getting. I did a piece about it here and the actual conclusion up until now is that they aren’t as horrible anymore as they where a few years ago but when doing the calculations they aren’t cheaper anymore then a Mean Well power supply for larger projects! For toying around, little adapters work fine but get something of better quality when leaving it running 24Hrs a day if you can. I’ve been sourcing power bricks from thrift stores and PC recyclers. I find I can get good quality 60-150W for $5. 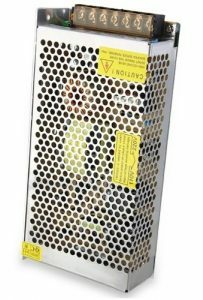 150-350W for $10-15, and smaller 5-50W for $2. Finding anything outside the typical laptop voltage range of ~14-21v 60W+ takes a little more digging through the bins. Also, you can’t be sure about age or condition. Some will have easily decoded manufacture dates, but most won’t. One clue is to look for the efficiency rating which are given as a roman numeral in a circle. Level IV became more or less mandatory ~2008 in most big markets. Level V became mandatory ~2012. For 12v supplies, OEM XBox and XBox 360 supplies can deliver a lot of power, but be aware that major hardware revisions to the console revisions bring power consumption reductions and the corresponding PSU’s have a lower power rating. A PSU suitable for an original run of the XBox can deliver something like 17A. Of course, if you need more than a few hundred W, and/or if you value your time and trouble more than bargain hunting, it’s probably better to just order a new MeanWell, or similar. As to the quality of cheap Chinese-brand (or unbranded) PSUs, there is still a lot of junk out there, at least among wall warts. A 12v “2A” supply that I got in a bundle with a LED strip from Banggood couldn’t even maintain regulation when the load was drawing ~1A. When I opened it up, it looked like someone had fitted a used or surplus board from a different PSU inside a new, larger, housing. Great comment! With power supplies it can be a bit of hit and miss. As you mentioned especially wall wart power supplies are often utter crap. Open frame are often a bit better but depending on the intended use, get a brand one! What is the newest pcb version ? BTW, the ftp link to the PCB files does not seem to be working right now. +1 here for interest in your pcb files. I’m looking forward to sharing some alternate Arduino based code once I get the right MOSFETs working in the boards. Fingers crossed for your internet connection. ordering MOSFETS is a bit tricky. 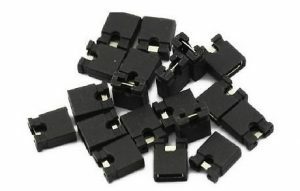 My first order of 10 pieces for € 11,55 (https://nl.aliexpress.com/item/Free-Shipping-Electronic-Components-Original-STP16NF06L-MOSFET-N-CH-60V-16A-TO-220-16NF06-STP16NF06-10pcs/32386724786.html?spm=2114.13010608.0.0.OVFryz) went well. They worked ok. But they are out of stock now. But the second order € 3,08 also 10 pcs where a lot cheaper (https://nl.aliexpress.com/item/Free-shipping-10pcs-lot-STP16NF06L-new-original/32675681110.html?spm=2114.13010608.0.0.OVFryz) but give problems. The LED stay dimmed even on 100%. Are the ones that are now on this page ok? 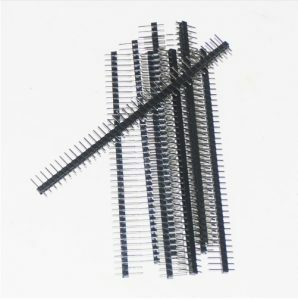 (https://nl.aliexpress.com/item/STP16NF06L-5pcs-lot/32337411571.html?aff_platform=product&cpt=1488990089208&sk=23f2vj6&aff_trace_key=f7afde253fe44bb0a52ecf973fca9fbc-1488990089208-00574-23f2vj6). Thanks for your work Andries. I like the QuinLED’s. Sorry for the trouble with the MOSFETs. I keep trying to find good suppliers for it and updating the links. The one’s I have linked right now I believe to be working correctly. At least, I haven’t heard any comments back that these are not working. If you get some, please let me know! 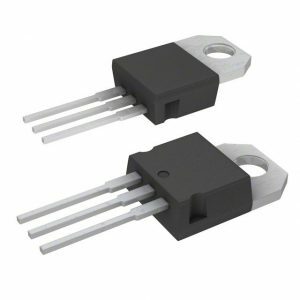 The MOSFET link is broken, do you know of another one? The ones I ordered don’t work. Yeah, sadly that keeps happening, only to the MOSFETs, but still. I’ll try and get another link, otherwise you could always try to source the MOSFETs locally, I’ve had good luck with that. 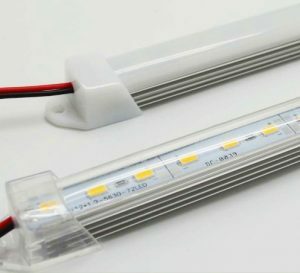 I’ve ordered MOSFETs from XOYUN Store in the link and they don’t work (the led strip is very dim when connected without ESP). Now waiting for delivery from local store. I’ve been messing with my QuinLED modules again, and it seems like I may have gotten some bad MOSFETs unfortunately. Without the ESP in the QuinLED, the lights light up rather dim (compared to connecting without QuinLED), and they do slightly flicker, especially the 5V ones I’m using. The 12V ones seem to be less affected by flickering, but they are much dimmer than they should be. I’m looking to buy some MOSFETs from Conrad, to make sure that’s the issue, but the datasheets for those things are simply horrible. For example, do I need an N-channel, or a P-channel MOSFET? I’m not sure how to look for the correct ones, except for opening every datasheet and checking voltage, amperage and gate threshold voltage, and even then I’m not sure I’m even looking at the right stuff. Sadly it sounds like you did Tim, although I never tested using 5v, I think technically it should work ok. Just get the STP16NF06L from Conrad, those should work fine. If you do want to get something else, at least make sure VGS(th) (Gate Threshold Voltage VDS = VGS ID = 250 µA 1 2.5 V) is below 3.3v for max. This example is from the official STP16NF06L datasheet where the max is 2.5v so with 3.3v it should always be fully open. Some MOSFETs state 2v – 4v, those won’t work because they require too much voltage.